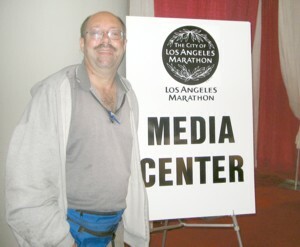 As an, um, "Distinguished", member of the "New Media", when I saw the Media Center area, the temptation to waltz right in, and make myself at home, was just too great. A nice lady was manning a table with a chair on my side of it in which a youngish media-type dude was sitting as she imparted her wisdom. On the left side of the room was a table with a few things on it. On the right was a table with a few computers, 1 of which was being used by another media-type dude. Near the entrance was a large board on a stand, on which various print stories, and press releases had been stuck with stickpins. I approached the nice lady, introduced myself, and asked for the ok to stick one of my cards to the board. Alas I was denied... now if I'd had a printout of my initial Blog story I would have gotten an ok to stick there, but I, of course, had not thought ahead to such a blessed opportunity, so had to settle for asking the nice lady to pass my card on to whoever was in charge of the Media Area, and hope that she would not lose it. 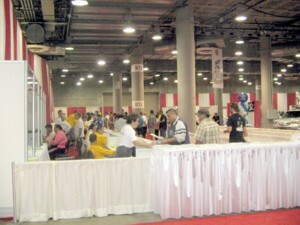 With the Quality of Life Expo being 2 days, there is lots of time for folks to get their Bib, and Goody Bag. I continued wandering around, and near the exit found another opportunity for placement of my cards for publicity. I, of course, was more than happy to assuage their keen disappointment in this regard, and so introduced myself, explained about the Dude, and bestowed upon each of the charming worthies their own little business card. And that's how I found myself inside another Inner Sanctum of the Expo, explaining about how I kept 3 nice Expo attendees from going away keenly disappointed, explaining what the Dude was all about to yet another nice lady, who called over her male boss, and politely requesting the OK to leave 25 of my cards neatly stacked on the table by the exit. One interesting encounter caught me completely by surprise, and led to my spending maybe 20 minutes, or more, I'm not sure, at 1 booth. When I asked people my survey questions I really did not expect to encounter enyone who had even heard of The Cycling Dude, even if they had heard of BikeBlogs. I was stunned when I began chatting with one of the gentlmen at the IonSports Network Booth, by asking him my survey questions, to have him say, "Yes, I've heard of you." In my surprise all I could manage was something sophisticated, and intelligent, along the lines of, "Um, how?" As he explained it, it had to do with being in the Sports Media, and keeping abreast of various trends, and such. One thing led to another and he asked me if I was interested getting more eyeballs for my Blog, including a free video, and asked me about my traffic, and began explaining to me about the Vision, and Mission, of IonSports ( It has a section that bills itself as The Original Sports + Lifestyle Social Network ), and how I, and the Dude, could be a part of it, joining others in blogging, and forums, on their site, and more, in what a visit to the website later told me was called, the Ion Cycling Section. It was all so interesting, confusing, and overwhelming, and I'm sure, despite his protestations that "No, no, we just met, and I can understand the way you feel", that he must have been frustrated by my trying to grasp just what his site was all about. In the end I try my best to explain to him that I have esssentially just started out with trying to publicize the blog, and bringing in advertising, and other income, over the last year, and am comfortable with the efforts I am attempting for now. I'm no expert in marketing, just an ordinary guy who, when he began Blogging, in 2002, never dreamed he could make a single dime doing it. One more thing... the man who was kind enough to chat with me for so long, and said he knew of The Cycling Dude.... was the owner of the company, Dave Behar. I also had a chance to talk with Geoff Barnett, Marketplace Manager for Competitor Magazine, at its booth. The website for the magazine has a nice Listing of Events Section which include links to cycling races, and Tour rides in Southern California, and the Western US. I also chatted with Gregory Graber, Director of Programs for the John Wayne Cancer Foundation, in Newport Beach, about Team Duke. Team DUKE is an athletic fundraising program unlike any other. You pick the sport. You pick the event. And all of your hard work benefits the John Wayne Cancer Foundation. You don't have to be a pro to wear our jersey. You've just got to have what John Wayne had - grit. Together we'll bring courage, strength, and grit to the fight against cancer. Your pick the sport,Team DUKE gives you the freedom to participate in as many sports as you want. Compare all this genuine interest with what happened at another booth, which shall remain unnamed, to protect, not the guilty, but the innocent. I had, on my 1st wallkabout, had left a piece of paper, with my URL, and a "Hi! Sorry I missed you!" message, at an unattended booth. I eventually returned to find a young lady, and much older man, holding down the fort. When I mentioned the note, and presented my card as a replacement, they both, innitially, showed an interest, especially the youg lady, but when, in response to her question about what type of links i had on my blog, I started to answer, the man suddenly said "Excuse me, a moment", and leaned in very close to the lady, and started talking too low for me to hear over the din of the room. I could tell the woman was caught off guard, and didn't seem too thrilled, but after 3 minutes of watching this, with no sign of our conversation resuming, anytime soon, I just faded away into the crowd. 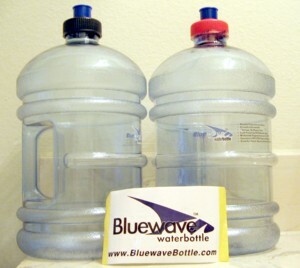 In addition to the the safety packet and t-shirt, bought to support McGruff The Crime Dog, I made another $10 purchase.... a pair of nifty Water Bottles! And so, finally it was time for me to head on out for lunch before starting the journey home. For me, the last few years, on my infrequent trips into Los Angeles, there are only 2 places to eat if I am close enough to do so, Tommy's on Beverly, or Phillipe's, a Block north of Union Station. 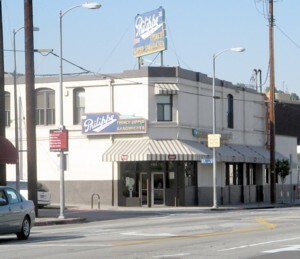 An LA institution, since 1908, and long located at the corner of Alameda, and Ord ( And yes, that is a Bike rack out front! ), it is justly famous as the Home of the French Dipped Sandwich, and is equally famous for the decor, and atmosphere including asawdust covered floor, and walls covered with the graffiti created by decades worth of scribblers writng their names, and brieff messages, on various walls on the different floors of the establishment. The place is popular with cyclists, and i rember the 1st time I visited was after a clube bike ride, years ago, when a dozen of us went inside, bikes, and all, and leaning our trusty steeds, against the south wall, out of eeryone's way, we got in line to order. Ever since I always spend $15. 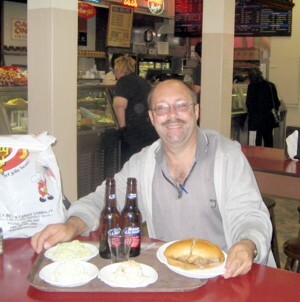 The Lamb Sandwich, Coleslaw, Macaroni Salad, and Potato Salad, all washed down by 2 lite beers, is well worth every penny! Another reason the place is justly famous is the large collection of framed old photos, and newspaper pages, on the walls. I always get a kick out of the 1952 Menus by the Gift Booth Cash Register. 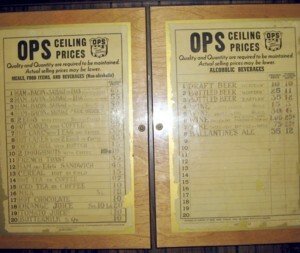 The prices ( Low Double digits in the 50's! ), and the size of the Menu, may change over the years, but the quality of the food stays the same, and even improves with age. On the crowded bus out of Los Angeles a well dressed, friendly, black lady, launched herself for the seat I had made available next to me by sticking my bags in my lap. As I did this she sat, and said, apologetically... "I'm fine". She HAD to say it! She had to give me the perfect opening! I stretched out my hand and, grinning ear to ear, said, "Hi, I'm Curly!" Trust me from years of personal experience, media rooms aren't what they're cracked up to be! Sure, there's often free food and drink and there's often free trinkets, but it's mostly reporters working hard on their stories for publication. Not very exciting at all, I must say. As the ride coordinator of the Tour de Stooges (May 5 in Lebanon, Ill.), I must applaud your efforts to include Three Stooges references in everyday conversation! Next time, you might try, "I'm Curly. Nyuk, nyuk, nyuk, nyuk."